Using the provider data from 2017 (the first performance year), Medicare reimbursements will be adjusted up or down for the first time in 2019, and the adjustments are significant. In 2019, the maximum adjustment to reimbursements will be (+/-) 4% and will increase until 2022 to (+/-) 9%. After 2022, the program will continue reimbursing and penalizing at the (+/-) 9% rate. This rate would then be multiplied by Medicare’s scaling factor, which could be up to 3x the reimbursement increases. This means that a provider receiving a 9% increase in reimbursement based on a high MIPS score could theoretically receive a 27% increase. The scaling factor allows Medicare to remain budget neutral by distributing penalties from low scoring providers to the high scoring providers. Who is eligible for MIPS? Also, providers participating in an Alternative Payment Model (APM), cannot also participate in MIPS. Accountable Care Organizations (ACO) and Patient Centered Medical Homes (PCMH) will not be reimbursed under MIPS. What can be done now to prepare? MIPS combines four different measurement criteria to score providers on performance. 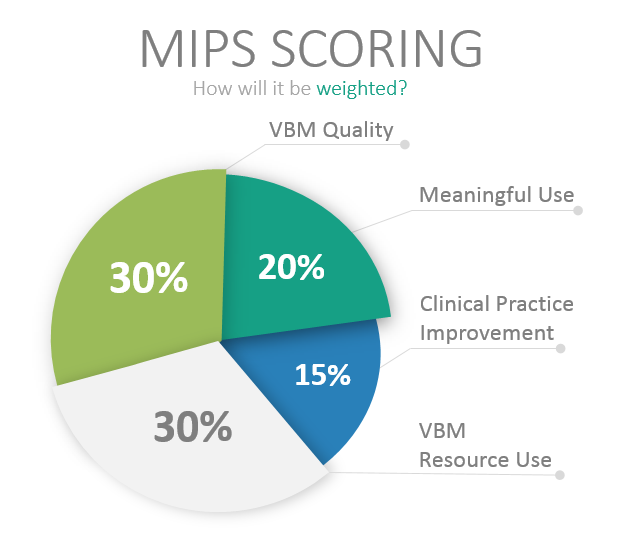 The best way to prepare now while MIPS is being finalized is to combine processes within your organization around the collecting and processing of data for VBM, Physician Quality Reporting System (PQRS), and Meaningful Use. Streamlining the collection of the criteria required by those three existing programs will benefit the organization as MIPS draws closer. While MIPS has yet to be finalized (expected in November of 2016), the basic framework has been defined, and there’s work that can be done now to prepare while the final details are refined. Organizations may find it challenging to collect the necessary data required based on the functionality of their electronic medical record reporting tools, but many EMRs currently have the functionality to report on many of the elements likely to be required by MIPS when finalized. However, patient engagement continues to elude many organizations, and is essential to improving patient quality metrics. In addition to consolidating and optimizing your reporting processes, building and expanding upon your existing patient engagement strategy will have a significant impact on your future MIPS reimbursement adjustments. Need help with your MIPS payment system strategy? Our consultants will work with your team to prepare your organization to be successful.